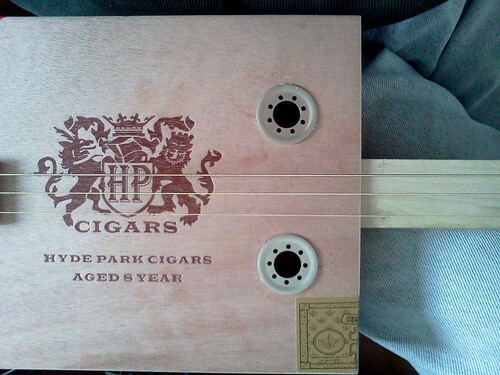 A few photos of my first cigar box guitar. For cigar boxes both Hyde Park Cigars (the place on 53rd and Harper) and Binny's have them, although the latter's supply is variable. The neck is 1x2 poplar from home depot. I bought the tuning pegs for about $10 from C.B Gitty and the strings online. The saddle is a hard drive spindle top as are the coverings on the sound holes. The bridge and neck are just pieces of the cigar box. There is a piezo pickup inside. So, the errors made in this build were: the holes drilled for the tuning pegs need to be aligned better. I drilled 1/4" holes with a forstner bit; these fit the pegs perfectly but not the little bushings-and the next biggest size was too big, leaving the lowest tuner a little bent. The neck doesn't hold the strings--I made a notch for each string but the highest string is too loose in the notch. The cigar box wood is too light for this. I cut out the cigar box to fit the neck but forgot about the box top so the box can interfere with fretting. I think a fret board might help. I wired the piezo backwards but no apparent harm; I'd like to experiment with positioning and how to attach them. I can't play, but it was easy, fun, and now I've got a cigar box guitar! I can't wait to improve upon it with another one. Amplifying audio without the use of any electronics: Audio Acoustic Amplifiers from Experimental Musical Instruments.